First, let’s establish what we do know. Based on multiple reports over the past three-and-a-half years, we know that the Central Intelligence Agency set up a secret program of arming, funding and training anti-Assad forces. This has been reported by major outlets, including the New York Times, The Guardian, Der Spiegel and, most recently, the Washington Post, which—partly thanks to the Snowden revelations—detailed a program that trained approximately 10,000 rebel fighters at a cost of $1 billion a year, or roughly 1/15th of the CIA’s official annual budget. In addition to the CIA’s efforts, there is a much more scrutinized and far more publicized program by the Department of Defense to train “moderate rebels,” of which only a few dozen actually saw battle. The Pentagon program, which began earlier this year and is charged with fighting ISIS (rather than Syrian government forces), is separate from the covert CIA operation. It has, by all accounts, been an abysmal failure. One thing the DoD’s rebel training program hasn’t been a failure at, however, is helping credulous reporters rewrite history by treating the Pentagon program as the only US effort to train Syrian rebels–now or in the past. As the US’s strategy in Syria is publicly debated, the CIA’s years-long program has vanished from many popular accounts, giving the average reader the impression the US has sat idly by while foreign actors, Iranian and Russian, have interfered in the internal matters of Syria. The Liwa Suqour al-Jabal, whose fighters have attended military training organized by the Central Intelligence Agency in Saudi Arabia and Qatar, was also hit last week by Russian raids as Moscow began its air campaign in support of Damascus. New strikes targeted the group’s main weapons depots in western Aleppo province and completely destroyed them late on Tuesday, its commander Hassan Haj Ali told Reuters on Wednesday via an Internet messaging service. The Defense Information Agency report from August 2012 confirms that weapons were flowing to the Syrian armed opposition after the overthrow of the Libyan government in Fall 2011. The claim that the U.S. was only supplying communications equipment and other non-lethal supplies in 2012 and 2013 was for public consumption and ‘plausible deniability’. In reality the U.S. was supplying great quantities of weapons. The ‘dark side’ included a huge budget for CIA operations including training and arming the Syrian armed opposition. 1986. Syria: Scenarios of Dramatic Political Change, CIA’s Director of Global Issues/ division’s Foreign Subversion and Instability Center. Reflects the main standoff against USSR, with other issues largely tools in the game. Have similarities with our time, despite the cold war ending. 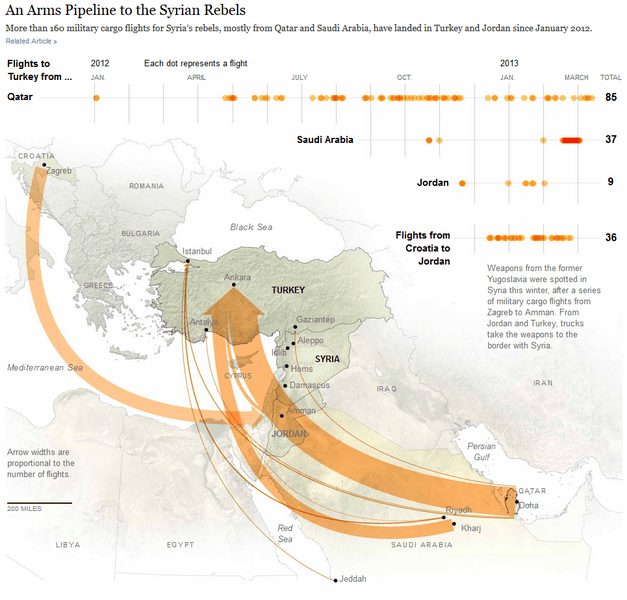 The massive, direct and immediate power interests of the US war state — not the determination to ensure that a pipeline would carry Qatar’s natural gas to Europe — drove the US policy of participation in the war against the Syrian regime. The Colombians, along with South African and other foreign troops, are trained by retired American soldiers and veterans of the German and British special operations units and the French Foreign Legion, according to the former employees and American officials. The former employees said that in recruiting the Colombians and others from halfway around the world, Mr. Prince’s subordinates were following his strict rule: hire no Muslims. Muslim soldiers, Mr. Prince warned, could not be counted on to kill fellow Muslims. The United States said Tuesday that Syrian President Bashar Assad has failed to prove himself a worthy leader nearly two months after being challenged by President Obama to guide his country toward a democratic transition or leave power. In endorsing Secretary of State Hillary Rodham Clinton’s declaration that Assad has “lost legitimacy,” the Obama administration moved closer to openly declaring its desire for regime change in Syria. The list of “supporting powers” is comprised of the US and several allies. Sept. 11, 2012, US Ambassador Stevens killed in Benghazi, Libya while organizing transfer of Libyan arms to Syria via Turkey. The Obama administration (not the CIA, not the State Department) secretly gave its blessing to arms shipments to Libyan rebels from Qatar last year, but American officials later grew alarmed as evidence grew that Qatar was turning some of the weapons over to Islamic militants, according to United States officials and foreign diplomats. But in the months before, the Obama administration clearly was worried about the consequences of its hidden hand in helping arm Libyan militants, concerns that have not previously been reported. The experience in Libya has taken on new urgency as the administration considers whether to play a direct role in arming rebels in Syria, where weapons are flowing in from Qatar and other countries. The Obama administration did not initially raise objections when Qatar began shipping arms to opposition groups in Syria, even if it did not offer encouragement, according to current and former administration officials. But they said the United States has growing concerns that, just as in Libya, the Qataris are equipping some of the wrong militants. A proposal to (OVERTLY?) arm Syrian rebels was backed by the Pentagon, the State Department and the Central Intelligence Agency, but the White House decided not to act on the plan. Defense Secretary Leon Panetta and Gen. Martin Dempsey, the chairman of the Joint Chiefs of Staff, revealed publicly for the first time at a Senate hearing on Thursday that they supported the proposal last year (2012) by senior officials including then-Secretary of State Hillary Clinton and then-CIA director David Petraeus. In the months after the start of the conflict in Syria in March 2011, the Pentagon, the State Department and the CIA began presenting the White House with multiple options for intervening with force, covert action or arms supplies. Options have included establishing a no-fly zone, bombing Syrian aircraft in their hangars, and funneling light arms and actionable intelligence to a select group of American-vetted rebels. Long story about fixer “Abu Ahmad” who worked two years for the CIA starting with their opening of the “Müşterek Operasyon Merkezi (MOM)” operation room in Turkey in 2013, modeled after the one in Jordan. The most recent offensive, dubbed Operation Southern Storm, began on 25 June. It was planned, equipped and directed by the [Military Operations Centre (MOC) in Amman], which is staffed by senior military figures from 14 countries including the US, Europe and the Arab Gulf. The MOC provides approved rebel groups with weapons, ammunition and salaries for fighters, and in return, the MOC directs the actions of the groups it supports. A senior defense official said that the remaining training “will be much more minimal” than the previous program. The Central Intelligence Agency runs a separate program to train and arm selected groups, many of which are now battling Syrian army units backed by Russian air power. CIA-backed rebels in Syria, who had begun to put serious pressure on President Bashar Assad’s forces, are now under Russian bombardment with little prospect of rescue by their American patrons, U.S. officials say. The CIA began a covert operation in 2013 to arm, fund and train a moderate opposition to Assad. Over that time, the CIA has trained an estimated 10,000 fighters, although the number still fighting with so-called moderate forces is unclear. CIA went to Moscow 10 days before the air campaign. 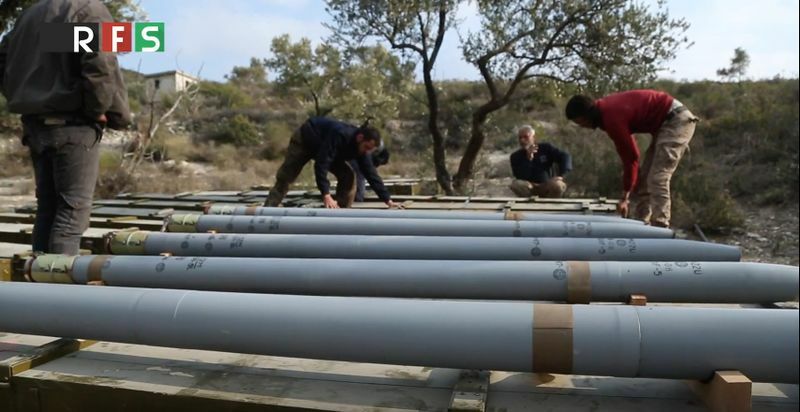 American antitank missiles supplied to Syrian rebels are playing an unexpectedly prominent role in shaping the Syrian battlefield, giving the conflict the semblance of a proxy war between the United States and Russia, despite President Obama’s express desire to avoid one. The U.S.-made BGM-71 TOW missiles were delivered under a two-year-old covert program coordinated between the United States and its allies to help vetted Free Syrian Army groups in their fight against President Bashar al-Assad. Now that Russia has entered the war in support of Assad, they are taking on a greater significance than was originally intended. The TOW missile program overseen by the CIA is entirely separate from a failed program run by the Pentagon that was intended to influence the outcome of the other war being waged in Syria, the one in the northeastern part of the country against the Islamic State. The CIA program got underway before the Pentagon one, in early 2014, with the goal of propping up the flagging rebellion against Assad’s rule by delivering training, small arms, ammunition and the antitank missiles, which have proved instrumental in eroding the government’s key advantage over the lightly armed rebel force — its tanks and heavy armor. Iraqi Prime Minister Haider al-Abadi said the deployment of such a force was not acceptable without Iraq’s approval, raising questions over how closely Washington coordinated the plan with Baghdad. Powerful Shi’ite Muslim armed groups pledged to fight any new deployment of U.S. forces to the country. Airstrike on SAA Saeqa military camp near Deir ez-Zor, December 6, 2015; on a separate page, + talk page. Responsibility disputed. Al-Akhbar claimed that the foreign powers operating the MOC promised rebels renewed aid in return for them agreeing to change tracks and launch a major campaign against Nusra. “Each faction that joins the campaign will receive five tanks with full training for their crews as well as other incentives related to salaries and armament,” sources told the pro-Hezbollah daily. The rebel leaders present in the Amman meeting all agreed to the MOC’s new plan, except the Youth of Sunnah Brigade chief, who eventually consented following further guarantees of support. According to Al-Akhbar, the rebels were also promised training in a US-prepared base that will be staffed by military experts from Britain, Jordan and other Western states. Defense Secretary Carter: Accelerate fight against ISIS, CNBC, Jan.22, 2016. ‘Leading from behind’ ground operation? We’re looking for opportunities to do more, and there will be boots on the ground — I want to be clear about that — but it’s a strategic question, whether you are enabling local forces to take and hold, rather than trying to substitute for them. US airstrike on SAA in Deir ez-Zor, Sept. 17, 2016; on a separate page. One senior U.S. official said that it is time for a “ruthless” look at whether agency-supported fighters can still be considered moderate, and whether the program can accomplish anything beyond adding to the carnage in Syria. The three Army Special Forces soldiers killed at a Jordanian military base this month were working for a CIA program to train moderate Syrian fighters when they were shot at a checkpoint under still-unclear circumstances. The soldiers were among roughly 2,000 U.S. troops working in Jordan while participating in the U.S.-led campaign fighting the Islamic State. Some of the troops have been assigned to mobile artillery units along the Jordanian border while others assist CIA-led training programs for Syrian opposition fighters. The debate over the proposed steps, which would for the first time position a limited number of Special Operations forces on the ground in Syria and put U.S. advisers closer to the firefights in Iraq, comes as Defense Secretary Ashton B. Carter presses the military to deliver new options for greater military involvement in Iraq, Syria and Afghanistan. “You either do it or you don’t “-Trump (CNN). in fact, raises an important question, ‘what does an average Syrian citizen want'(with respect to Asssad)–how do they know? –They seem to take the answer for granted. Senator Graham: “is it smart to have Russians fight IS, and we stay out of the fight?” (Answer provided to him was not affirmative). US military advisors are alleged to have started training so-called moderate rebels near the city of Salma in the Latakia province in what amounts to breaking a pledge not to put US boots on the ground in Syria, Lebanon’s satellite television channel al-Mayadeen reported, citing an unnamed military source. “American officers began training Turkmen militants around Salma in the Latakia Province,” the media outlet noted, adding that the mission was previously carried out in Turkey. 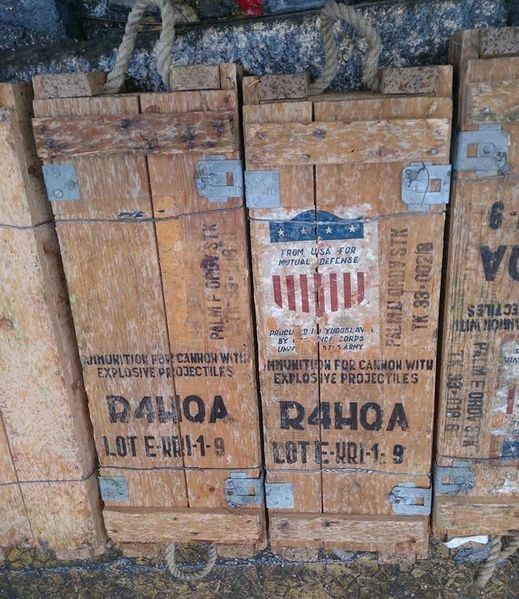 The FBO has released two solicitations in recent months looking for shipping companies to transport explosive material from Eastern Europe to the Jordanian port of Aqaba on behalf of the US Navy’s Military Sealift Command. Released on 3 November 2015, the first solicitation sought a contractor to ship 81 containers of cargo that included explosive material from Constanta in Romania to Aqaba. The solicitation was subsequently updated with a detailed packing list that showed the cargo had a total weight of 994 tonnes, a little under half of which was to be unloaded at Agalar, a military pier near the Turkish town of Tasucu, the other half at Aqaba. 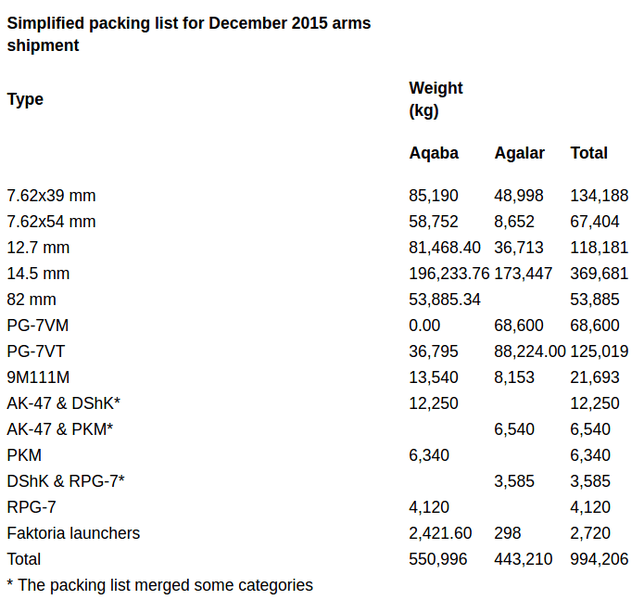 Over the last five years, Ukraine alone has sold nearly 615 thousand units of small arms to Syria. But it’s curious that its officials customers are not some third world countries, but large Western companies like Hire & Fire, IZH Impex Inc, Waffen Schumacher GmbH, BVS, spol. Sro – all buying old Soviet weapons en masse. In 2012 alone the American Hire & Fire made an acquisition of 90 thousand Soviet rifles. That’s almost enough to arm four divisions! And in just one year! The halt in assistance, which has included salaries, training, ammunition and in some cases guided anti-tank missiles, is a response to jihadist attacks and has nothing to do with U.S. President Donald Trump replacing Barack Obama in January, two U.S. officials familiar with the CIA-led program said. The support funneled to vetted FSA factions has included contributions from Turkey, Qatar and Saudi Arabia – states that have opposed Assad. It is one of several foreign aid channels to rebels. Others still function. They spoke on condition of anonymity given the covert nature of the CIA-backed program and the sensitivity of the subject. But guided anti-tank missiles have been hard to come by in recent years — the wars in Syria, Iraq, Afghanistan, and elsewhere have depleted the stockpiles. So Purple Shovel and Regulus, in a bizarre move for a US deal, were buying the Konkurs from the sanctioned nation of Belarus, which had been under European Union arms embargo and is often called “Europe’s last dictatorship.” It’s considered a rogue state, dealing with Syria, Iran, and North Korea. BuzzFeed News has previously revealed that SOCOM was aware the missiles were being bought from Belarus. It’s April 6, 2017. Jeddah, Saudi Arabia. The Denmark-flagged Marianne Danica cargo ship has arrived in the biggest seaport in the Kingdom of Saudi Arabia. The ship had left Burgas ten days earlier (March 28) loaded with tons of weapons, a fact confirmed by Marinetraffic.com satellite tracking data. The ship was declared as carrying a Hazard A (Major) dangerous cargo, which in accordance with the International Cargo Classification system denotes weapons and explosives. The dangerous cargo is unloaded within 8 hours of the ship arriving in Jeddah, and the ship sets return course to Burgas. The Bulgarian weapons shipments are not meant for Saudi Arabia which could not use it in any event, as its military uses only Western weapons. In December 2016, Trud reporters discovered Bulgarian weapons manufactured at VMZ-Sopot, in 9 An-Nusra jihadists’ storage facilities in eastern Aleppo in Syria. An-Nusra is considered a terrorist group due to its ties with Al-Qaeda. In spite on the ban on exporting weapons due to the war in Syria, two million shells and 4 thousand Grad rockets have made their way from Bulgaria to the jihadists in Aleppo, as demonstrated by our investigation in Syria. The boxes in markings in the Bulgarian language, which indicate Bulgaria was the country of origin, contain 122mm Grad rockets. After decades of accepting bribes from the Saudi government, the CIA is currently funneling guns and money to Syrian rebels and terrorists. Under the “Timber Sycamore” program the Saudis provide funding and purchase weapons for Syrian rebels, while the CIA trains them in secret camps in Jordan. As for the war in Syria, the CIA and Saudi Arabia back in 2013 agreed to conduct a joint operation under the codename: Timber Sycamore, the prime goal of which was the toppling of the legitimately elected Syrian president. Under this agreement, the Saudis have been providing arms and resources, while the CIA trained “insurgents” before deploying to the battlefield. The newspaper names other “sponsors” of the CIA campaign: Turkey, Jordan and Qatar. Although the exact amount of the “contribution” of each of the states to the secret operation in Syria remains unknown, it is mentioned that Saudi Arabia has been one of the main sponsors, providing billions of dollars. The failure to produce an official FSA leadership does not mean that there are no material structures connecting these segments of the insurgency. Thousands of rebel fighters have by now been vetted, trained, and approved for material support via two Military Operations Centers, which feed the insurgency from across the Turkish and Jordanian borders. The one in Turkey is colloquially known as the MOM, for Müşterek Operasyon Merkezi, while its Jordanian counterpart is called the MOC, after its English initials. Apart from Turkey and Jordan, these centers gather representatives of the United States, Saudi Arabia, France, and a bunch of other governments. Their role is to coordinate and supervise the flow of arms and ammunition to a select number of rebel groups. Foreign intelligence services, chief among them the CIA, collaborate through these centers to pick which groups should be eligible for support. They will not receive a stamp of approval until their members have been vetted for suspicious contacts, declared that they will stay away from alliances with al-Qaeda, and showed some interest in a negotiated solution to the conflict. The groups involved enjoy different levels of trust and approval, but many also receive “unofficial” support on the side from, for example, Turkey, Qatar, or Saudi Arabia, or various private funders. So far, this arrangement has been accepted by something like a hundred rebel factions all in all, although a head count is complicated by the fact that they are often folded into overlapping regional umbrellas. While each faction is typically quite small and few of them enjoy national name recognition, they collectively make up a fairly significant segment of the armed opposition. In southern Syria, MOC-funded groups seem to account for a majority of the insurgency. The northern MOM-backed factions enjoy less influence than their southern counterparts, but they are still a considerable force around Aleppo, and some have used U.S.-manufactured missiles to establish themselves in an important niche role as anti-tank units in the Idleb-Hama region. These groups are what the U.S. government typically refers to when it talks about “the FSA” and there is indeed a very considerable overlap between MOM/MOC-backed factions and factions that self-designate as “FSA.” This crude definition (MOM + MOC = FSA) is also increasingly used by the Syrian exile opposition, the rebels themselves, and others who follow this conflict. The article also discusses Russian interaction with FSA, from the American perspective. According to Russian sources (TASS, Russian): The Russian army supports some forces of the “Free Syrian Army”, which conduct offensive operations against the “Islamic State” , told the press secretary of the president of Russia, Dmitry Peskov. Some 5000 fighters are said to be involved (‘and numbers growing’), with Russia providing some air support, supplies and ammunition. Exact groups involved were not specified. This appears to be an attempt to create their own ‘moderate opposition’ version and counteract US efforts, not exactly a diplomacy or ‘elite level trolling’. (As somebody said, opposition is moderate as far as it believed to be controlled; thus US controlled opposition does not have to be the same as Russia -controlled opposition, despite making an even messier situation). The Obama administration pursued secret communications with elements of Syria’s regime over several years in a failed attempt to limit violence and get President Bashar al-Assad to relinquish power, according to U.S. and Arab officials. Early on, the U.S. looked for cracks in the regime it could exploit to encourage a military coup, but found few. In the months that followed, a debate within the White House emerged on whether to redouble U.S. opposition to Mr. Assad or prioritize the Islamic State fight at the expense of the mission to go after the regime. One of the photos is at least 2 weeks old. Similarly themed publication show an arsenal of weapons, communication equipment (Thuraya satellite communication, a drone, etc), and a video fragment, Daily Mail, July 28, 2016. Several sources say the training given to Syrian rebels consisted of guerrilla attacks and targeted assassinations. I wonder what rebel group would use or need this kind of tactics. Actually these are the terror tactics used by Al-Nusra Front. The most senior officer to defect from Syria’s armed forces is plotting a series of guerrilla attacks and targeted assassinations from self-imposed exile in Turkey in an attempt to topple the regime. U.S. Special Operation Forces reportedly have been in Syria since December training groups to conduct guerrilla attacks and assassinations to bring down Syrian President Bashar al-Assad, according to a leaked Stratfor memo published by WikiLeaks. Faced with almost certain defeat in the city of Aleppo, Syrian rebel groups have promised to continue their war by adopting the guerrilla tactics of assassinations, armed raids and roadside bombs. Nato has been giving similar training to Ukrainian reconnaissance and sabotage groups. Despite cancelling their ‘rebel’ training program, the US has now airdropped 50 tons of ammunition for smalls arms, along with grenades, into the ISIS hotbed of Northern Syria. According to Van Linge’s Situation in Syria map, ISIS has minimal presence in Hasakah (northeast corner), but there are some government-held areas and even areas of joint Kurdish-government/loyalist control (like in the capitol, and Qamishli on the border). Otherwise it’s held by Kurdish YPG militias, not in cooperation with FSA as is the case in Kobane. This is interesting given the Kobane precedent, where weapons were delivered to FSA and not Kurds, to avoid rifling Turkey (mentioned in above report). The likely recipients this time will be YPG, depending on where, either to push ISIS south or to attack the last government-held areas. Moslem said “These weapons have been given not only to us but also to the Arab groups we act together. … PYD co-chair lastly stated that operations against Raqqa and Jarablus are on the table and that they are working only for the timing of the operations at the moment. He added that Russia would be positive about the operation. Both mentioned cities are well to the west, adjascent to areas of joint PYD-FSA control, so the pattern is not much different. Still, Turkish Prime Minister Davutoğlu’s threatened that “we could intervene (against) the PYD”, to which Moslem responded they would defend themselves if attacked by Turkey, but had no plans to attack them or transfer weapons to the PKK. A day later, the YPG spokesperson Redur Xalil released a statement saying that Saleh Moslem doesn’t speak for the YPG and hasn’t detail knowledge of military operations. The US, he says, “knows to who they sent weapons”, likely referring to US statements insisting that “Arab groups” had received the ammo. Curiously on the same day, a new coalition of YPG and some regional Arab groups was announced and named Syrian Democratic Forces. In their founding declaration they thanked the US-led coalition for their support. Russian volunteer Timur, in Syria with Kurds, and a regular contributor to Rusvesna, describes NATO sponsored shipments of Soviet design weapons, produced under license in Bulgaria and smuggled to (all) anti-government forces via Turkey rusvesna, 26.10.15. He refers to Kurdish intelligence sources and also says that recently Syrian government forces were capturing suspiciously new Soviet design weapons from the rebels. He indicates that FSA as well as extremists are receiving weapons (but does not make much distinction between those anyway). US needs a new strategy? it is preferable for ISIS-held territory to be reconquered either by moderate Sunni forces or outside powers than by Iranian jihadist or imperial forces. For Russia, limiting its military role to the anti-ISIS campaign may avoid a return to Cold War conditions with the U.S.
Stephen Cohen: ‘There is no Alternative’ to Putin’s Strategy in Syria’ sputniknews.com, 17.10.15. Exactly where Ford needs a certain effect, he conjures the right words, even when those words are the most opposite of true. As soon as he saw clear evidence in the July 31 attacks that the violent insurrection in Hama was really underway, he needed all the cover he could find to help the seeds take root. So as soon as there were armed gangs running streets and bridges in Hama, he became more vocal than ever about this being a regime lie, by definition. A review of the subscription only (mirror) article by Jack Murphy.